Well that season went by far too quickly, didn't it? What a year, bizarre, nerve wrangling, and utterly wonderful in equal measures as the title race went down to the wire and the top 4 opened its doors to the top 8. Because we love football at the Ephemeric, and I personally have too much free time this week, we are pleased to present to you our epic, in depth review of the season. 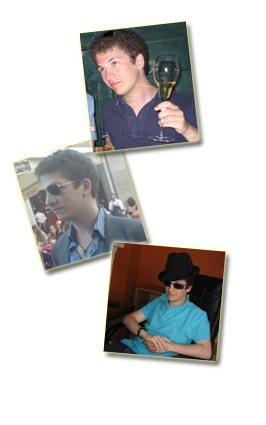 Credit to the following consultants on this article: Alex Roberts, Ben Fitzgerald. We'll begin with our season summary and team of the season, and then follow with a team by team review. Goalkeeper: Joe Hart- Harshly sent on loan to Birmingham after he was deemed too good to be an understudy for Shay Given (if only HE was English, am I right? ), Joe Hart has been one of the breakout young stars of the season, helping overachievers Birmingham to a top half finish in what has been a remarkable season for them built around a solid defence and masterful goalkeeping. Right Back: Branislav Ivanovic- Started the season as a nobody, an understudy, a versatile defender who can play in all defensive positions. Ivanovic has taken the opportunity presented by Chelsea's injuries to show what he can do, and boy has he taken it. Sweats blue blood week in week out, runs up and down the flank without tiring, can tackle, cross, beat defenders, simply a class act who's come from nothing. Thoroughly deserved his place in the official PFA team of the season. Centrebacks: Thomas Vermaelen & Richard Dunne- A close runner up for signing of the season, Vermaelen is a classy central defender with a real eye for goal, certainly one of the shining lights of this year's Arsenal team. Meanwhile Richard Dunne has been a near impervious wall at the back of another impressive Aston Villa team, and was a key pillar of one of the tightest defences in the league. A lot of pundits have put John Terry in their team for maintaining his strong form despite off the field shenanigans, but for me these two edge it. Left Back: Patrice Evra - This was a very tough call between Evra and Ashley Cole. On his day, Ashley Cole is easily the best left back in the world, and he showed this with his stunning form this season, creating and scoring goals, whilst impeccable at the back. But in the end Cole has spent too much time injured this season to make the team, it's hard to judge the consistency of a player who only plays a handful of games. I'm going to give this one to Evra, who has been frankly awesome for United, their best defender this season and a constant attacking threat. Right Mid: James Milner - He's been a hotly tipped player since his days at Leeds, this is the season where he finally came of age on the back of an impressive showing at the European U21 Championship. Moved into a more central role for much of the season but with the versatility to move out wide, Milner is a top talent and a shoo-in for the England squad this summer. Centre Mids: Cesc Fabregas & Frank Lampard- Once again, Cesc appears to be carrying this Arsenal team at times, and this season is probably his best yet as he continues to edge toward his potential. Meanwhile, after a slow start Frank Lampard ended up having the best season of his career, scoring a personal best of 22 goals in the league, scoring over 20 in all competitions for the 6th consecutive season, he also topped the assists chart. Surely a key man for England this summer. Left Mid: Florent Malouda - He took his time about it, but this season Malouda finally hit the kind of form that saw him signed from Lyon. Particularly in the second half of the season he has transitioned from superfluous so and so to absolute world beater, the form player in the league for the last few weeks. Forwards: Didier Drogba & Wayne Rooney - Can be few arguments here. Tevez unlucky to miss out after another fantastic season (I wonder if any Man U supporters are still going to criticise me for rating him above Berbatov), but Drogba has had the season of his life, with 29 league goals, more in other competitions, and plenty of assists to boot, and that's despite being away at the African Cup of Nations. Meanwhile Rooney is my player of the year, and without a doubt one of the best in the world right now. He is just a complete player, he is fast, strong, sublime technique and a genius, without him Man United look lost, and England will too if he's not fit. They were considered "in" the title race for long periods of the season according to the media, but one look at the statistics, and the total number of points would suggest that not a whole lot has improved since last season, and their prominence may have more to do with how poorly Chelsea and Man United performed for much of the year. They certainly benefitted from the shock collapse of Liverpool, but in the end were pushed very close by Spurs for 3rd. Nevertheless, Arsene Wenger always impresses with his ability to pull together consistent winning performances from a squad that on paper looks pretty lightweight compared to their rivals, and even their first xi seems to weak aside from one or two world class players. It is a testament to his skills that players like Gibbs, Denilson can slot into the team with little affect on results. 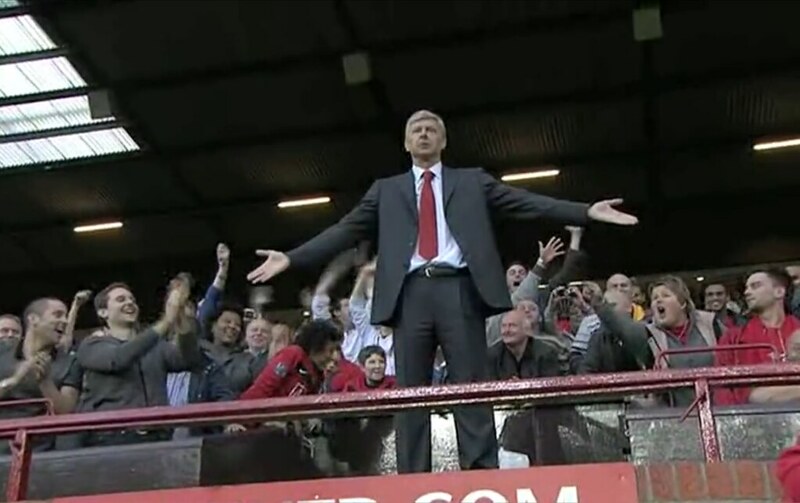 Wenger also was the man behind the "moment of the season" where having been sent off for the heinous crime of kicking a bottle of water, walked straight into the Man United fans at Old Trafford and adopted a frankly Christ-like pose (pictured above). Epic. But Fabregas continues to go from strength to strength, Robin Van Persie looked sharp before his injury, and Vermaelen is a fantastic signing in the defence. A few choice signings in the summer, as they can afford thanks to the positive financial policy in the club, and Arsenal can do even better next season so long as Wenger doesn't lose his knack. Another positive season for the club, but as I predicted, not quite in the running for the top 4 when it comes to crunch time. Their defence was particularly impressive with the likes of Dunne, Cuellar, Warnock and Collins all formidable, and Brad Friedel having yet another strong season in goal. James Milner was a revelation, and Downing looked up for it when he returned from injury. The question is whether they can keep ahold of their players, with Young and Milner both heavily linked with a move away from Villa Park. My pick for the season's biggest overachievers. I had a suspicion that of the newly promoted teams Birmingham had the potential to fare well, but I had no idea how strong they would be. Alex McLeish was known for working miracles with Scotland and he's done it again here with a fantastic top half finish, owed mostly to some sublime form in the run up to New Years. The key for them has been the successful rearguard action, Roger Johnson has been on song at the back, and in particular Joe Hart has had a stunning season. Another team that performed marginally better than expected, but then it was only a matter of time before Sam Allardyce worked his club building magic at Ewood Park, and I guess that time has come. In the second half of the season in particular they have been very strong, especially at home where in the last few games of the season they drew with Chelsea, Man U and beat Arsenal. Chris Samba is a rock in the defence, and Paul Robinson looks like a man reborn, and must surely be in with a shout of the England squad. David Dunn has also been excellent and dangerous when fit, which is not often. A pretty much expected season of mid table obscurity, things certainly took a turn for the better with the appointment of Owen Coyle as manager. The man who pulled off some special accomplishments with Burnley steered Bolton to safety, and it will be interesting to see how he can build on this for the future. Kevin Davies is a consistent performer, and does the job that is asked of him, while Jack Wilshere on loan from Arsenal has had a decent, if unremarkable season. Meanwhile Gary Cahill looks a real talent at the back. A long and difficult season despite some heartening performances at home, predictably ending in relegation. Losing Owen Coyle was a massive blow, but bright performances form some players like Fletcher and Alexander. At the start of the season I predicted they would be there or thereabouts, but felt that a lack of consistency and an overrated manager would see them miss out. Well it's hard to deny that they have been wildly inconsistent, and in the end they won the title simply because Man U have been even worse. But that being said, when they have been on form they have been sublime, breaking pretty much every goalscoring record in the book, playing stunning champagne football, taking the golden boot, the golden glove, and most importantly the Premier League title. In a few days time they might even add the FA Cup to make this the most successful season of all time for Chelsea. I have to hand it to Carlo, he has exceeded my expectations for all the above reasons, and if that wasn't enough, it seems our investment in youth is starting to pay dividends, with several teens playing a part in the title win (mostly due to injuries) and the youth team winning the coveted FA Youth Cup for the first time in 40 years. That being said there is work to do, this squad won't play at this level for much longer. Ballack and Deco are done, Ferreira is not good enough, but perhaps useful as a 3rd choice. Even Lampard, Drogba and Anelka are getting on now and won't be around for more than a couple more seasons, so reinforcements are necessary. Ancelotti has already stated that he intends to promote 5 youth products to the first team next season, but it's hard to see Chelsea retaining the title without one or two world class additions to bridge the gap between old and new. Another season on the fringes of the big time, Everton got off to a shaky start, but since New Years they have arguably been as good as any other team in the league. Blessed with an array of midfield talent from the likes of Cahill, Fellaini, Donovan, Pienaar, Arteta, Rodwell and others, as well as one of the top managers in the league in David Moyes, Everton are a good side. If they invest wisely in the summer they are more than capable of building on this for next year provided they can keep hold of their players. For the first time in years they also have product up front with Louis Saha now fit and in good form, another striker to partner him and they could be very dangerous. A similar season to last year, comfortable midtable finish despite a complete lack of quality or depth in the squad. The fact that Bobby Zamora (who to be fair to the lad has delivered) is their key man says it all really. On top of this they have somehow worked their way to the Europa League final, a historic day for the club and a wonderful day for English football in general. Credit must surely go to Roy Hodgson, my pick for manager of the year. A long and painful season for Hull which saw bad losses, a change in management, and not much to celebrate. The future remains very unsure, and if I were them I would keep ahold of Dowie, a man with a proven track record in the Championship. Rebuilding is necessary, but with no money it's going to take a lot of work this summer. Summer transfer targets: A miracle. Well I don't think anyone saw this coming. A disaster of a season in every single regard, on and off the pitch. Terrible results, a team and manager bereft of confidence, piling debt and jaded and unpopular owners looking to sell. The problem with Liverpool recently has been that aside from Gerrard and Torres they don't have a whole lot of world class quality in the side. So with Torres injured so often and Gerrard in woeful form this season it is no surprise that they have fared so poorly, and it wouldn't surprise me to see either or both of them leave this summer. The future is very uncertain for Liverpool right now and while massive rebuilding is needed it's hard to see how that's going to happen right now with no money and the possibility of their two key players leaving. More improvement, but not quite there yet. Another summer of big spending could put them in contention with the top 4, but without champions league football it will be that little bit harder to entice the big names. Mancini has done a good job since arriving at the club, but to be honest they have the players to win games no matter who's in charge. In particular Tevez has been an absolute star, scoring bucket loads, supplying a lot more, and generally working his socks off. Ex-Arsenal signings Touré and Adebayor have also been good, but there is still a surprising lack of consistency with the defence that will need to be looked at. United fans will be crestfallen that they were unable to clinch an unprecedented 4th consecutive title, especially following such an unconvincing and inconsistent season. Particularly worrying is the toothlessness the club shows when Rooney is not present. Berbatov has been a 32 million pound flop, and they could really have used Tevez this year. Equally worrying is how reliant they still are on the likes of Scholes and Giggs, now past their mid 30s. That being said, Wayne Rooney is amazing, one of the best in the world. Patrice Evra has had the best season of his career so far. On top of this there are some decent young players waiting in the wings, like Obertan and Gibson. Nani and Valencia will have to be on top form next season unless signings are made this summer. Nightmare season for Portsmouth, administration, bankrupt, points deducted, relegated. Everything has gone wrong for them this season. That being said, Avram Grant has picked them up since his arrival and is a good bet to help them recover next season. The FA Cup had provided a silver lining for them with their successful cup run that has led them to the final against champions Chelsea. You couldn't set up a better final than first vs last, and I wouldn't count them out of it either. Another success story as Stoke had a very impressive season, again built around defensive excellence with the likes of Sorensen in goal and Shawcross in defence. Pulis has done remarkable work this season, but as we've seen in the past with Reading and Hull, overachievers one year can become relegation fodder the next. Solid season marked by inconsistency, a few heavy losses here, an impressive upset there. Darren Bent proved to be an inspired signing as he rode high in the league scorers table, while Craig Gordon looked back to his best at times in goal. Other players, however, have disappointed, none more so than Fraizer Campbell, who promised to be a competent foil for Bent but never really found his footing. Reinforcements in the midfield and defence, and perhaps another striker to partner Bent, would go a long way toward securing safety again next season and pushing forward with the club's ambitions. Harry Redknapp has done it again. The man who brought Pompey FA Cup success has now successfully led Tottenham to their first every Champions League via a 4th place finish, and came to within a whisker of pipping Arsenal to 3rd on the last day of the season. This Tottenham team has really hit its potential this season, with the likes of Lennon, Defoe, King and Bale all very impressive, despite their injuries, the likes of Dawson and Gomes ensuring solidity at the back, and a creative midfield. But one has to wonder if this squad is capable of going further or if this is their peak. It is fortunate then that Spurs have never been shy about spending in the transfer market, and a summer of wise spending could see them push the big boys even further. After a good first season with the club, nicest man in football Gianfranco Zola has had a torrid time this year, just scraping survival. That being said, he is still popular among the fans and players, even though his bosses have never hidden their lack of faith. The jury is still out whether he is truly to blame, let's face it the team is not in great shape, and the new owners have not done much to bring a stabilising presence to the club in a difficult season. That has not stopped the death knell from tolling for Zola, and the club is now on the lookout for a new manager, perhaps harshly, as well as new players. And as if Zola did not have enough people's sympathies, when journalists spent the entire day camped out in front of his Kent home in the cold trying to wrangle a response, Gianfranco brought them all tea and coffee, brewed their drinks himself, and apologised in his smiley way for not answering any of their questions. Whatever happens to the man professionally, he's a legend and a true gentleman. A poor season for Martinez's men, typified by some atrocious away form that has seen them lose 16 out of 19 away games in the league this season, conceding 8 goals or more on two occasions. However, he has managed to keep his team safe, which in retrospect is an accomplishment considering the turbulent start they had to the season. Now it is necessary to build the team once again and try to push up into mid table, while preparing for potential exits for key players. As expected, McCarthy has got his boys working their socks off, and despite never really looking like much of a team they have managed to at least keep consistent and get the results that keep them safe in the premier league. Kevin Doyle lived up to everyone's hopes and has been absolutely vital for the team's efforts. Now they face a challenge to keep him at Molineux.